Methi Mutter Malai- This is one of the famous dish of North India. The combination of fenugreek leaves & Green peas cooked together with cream. I always wonder how could this combo of methi in this gravy tastes? I tasted this recipe in Restaurant which my hubby ordered. Finally I tried this recipe, Wow It was Amazing & Very tasty. Now a days I am make this once a week. Heat oil in a pan, add ginger,garlic,chillies, onion , tomato & allow to sweat. Make it cool & grind a fine paste. Heat oil in a pan, add cumin seed & allow to temper. Add washed & chopped Fenugreek leaves & sauté. Add green peas & sprinkle of water & cook until soft.Add ground onion tomato paste & mix well. Add garam masala & mix well. Add fresh cream & allow to boil . 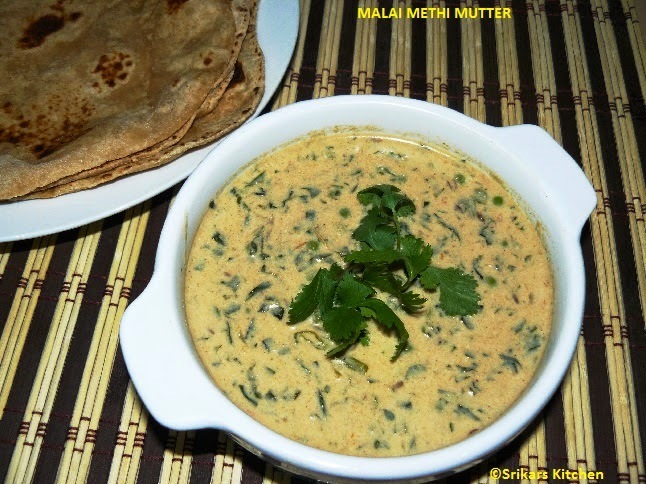 Methi matar malai looks creamy and tasty! Love this curry, looks delicious and creamy..